This knitted scoop-neck pullover sweater has Fair Isle detailing at the hem and cuffs. The pullover sweater features waist shaping and clean lines for a feminine, flattering fit. Start knitting the back by using US 6 needles (or one size smaller than needed to match gauge) to cast on 91 (99, 107, 123, 139, 147) sts with MC. Work in stockinette stitch (knit a row, purl a row) for 10 rows, ending with a WS row. Purl 1 RS row to create a turning ridge for the hem. Switch to US 7 needles (or the size needed to match gauge) and continue in stockinette stitch for 1 inch, ending with a WS row. Begin the Fair Isle pattern by working the right selvedge stitch outside the dark line in this chart. Work across the 8-stitch pattern between the dark lines 11 (12, 13, 15, 17, 18) times. Work the 2 left selvedge stitches. Work the chart repeat 11 (12, 13, 15, 17, 18) times. Work the selvedge stitch at the right side of the chart. 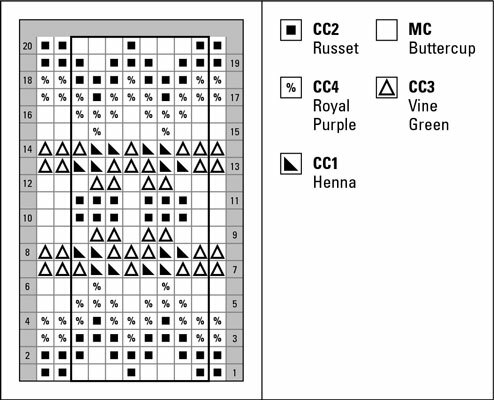 Work through all 20 rows of the chart. Continue in stockinette stitch with the main color only. The pullover will measure about 4 1/2 inches from the turning ridge. Next RS row (Decrease Row): K2, ssk, knit to last 4 sts, k2tog, k2. Repeat the decrease row every 4th row 4 more times. There are 81 (89, 97, 113, 129, 137) sts. 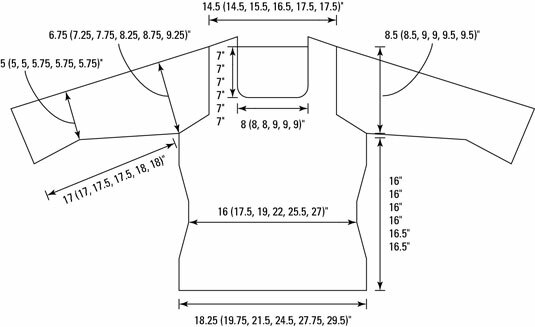 Work even until the sweater measures 9 inches from the turning ridge, ending with a WS row. Next RS row (Increase Row): K2, m1, knit to last 2 sts, m1, k2. Continue in stockinette stitch and repeat the increase row every 6th row 4 more times. There are 91 (99, 107, 123, 139, 147) sts. Work even until the front measures 16 (16, 16, 16, 16 1/2, 16 1/2) inches from the turning ridge. Begin shaping the armholes by binding off 5 (6, 7, 8, 11, 12) sts at the beginning of the next 2 rows. Bind off 3 (5, 5, 8, 10, 12) sts at the beginning of the next 2 rows. Next row (RS): K2, ssk, knit to last 4 sts, k2tog, k2. When all decreases have been worked, 73 (73, 77, 83, 87, 87) sts remain. Work even until the back measures 5 1/2 (5 1/2, 6, 6, 6 1/2, 6 1/2) inches from the beginning of the armhole shaping, ending with a WS row. Next row (RS): K22 (22, 24, 24, 26, 26) and slip these sts to a holder for the left shoulder, bind off 29 (29, 29, 35, 35, 35) sts, knit to end of row. There are 22 (22, 24, 24, 26, 26) sts. Next row (RS): K1, ssk, knit to end of row. Repeat the previous 2 rows 5 more times. There are 16 (16, 18, 18, 20, 20) sts on this shoulder. Work even until the armhole measures 8 1/2 (8 1/2, 9, 9, 9 1/2, 9 1/2) inches, ending with a RS row. To shape the right shoulder, bind off 8 (8, 9, 9, 10, 10) sts at the beginning of the next 2 WS rows. To shape the left neck, first replace the held stitches on the needle with the WS facing and rejoin the yarn. Next row (RS): Knit to last 3 sts, k2tog, k1. Work even until the armhole measures 8 1/2 (8 1/2, 9, 9, 9 1/2, 9 1/2) inches, ending with a WS row. For the left shoulder, bind off 8 (8, 9, 9, 10, 10) sts at the beginning of the next 2 RS rows. Follow Steps 1 through 14 to work the front. There are 73 (73, 77, 83, 87, 87) sts. Work in stockinette stitch for 1 inch. Follow Steps 19 through 26 for the front. The front neckline is deeper than the back, so there will be more rows worked between the end of the neckline decreases and the beginning of the shoulder shaping. To begin making the sleeves, using the US 6 needles (or one size smaller than the size needed to match gauge), cast on 51 (51, 51, 59, 59, 59) sts. Work in stockinette stitch for 6 rows, ending with a purl row. Purl 1 RS row to create a turning ridge. Switch to the US 7 needles (or the size needed to match gauge) and continue in stockinette stitch until the sleeve measures 1 inch from the turning ridge. Begin working the Fair Isle border, by working the right selvedge stitch outside the dark line on the chart. Work across the 8-stitch pattern between the dark lines 6 (6, 6, 7, 7, 7) times. When the Fair Isle border is complete, work 3 rows in stockinette stitch with MC. Continue in stockinette stitch with MC and repeat increase row every 8th row 7 (0, 0, 0, 0, 0) times; every 6th row 0 (10, 12, 11, 8, 4) times; then every 4th row 0 (0, 0, 0, 5, 12) times. There are 67 (73, 77, 83, 87, 93) sts. Work even until the sleeve measures 17 (17, 17 1/2, 17 1/2, 18, 18) inches from the turning ridge, ending with a WS row. Begin to shape the sleeve cap by binding off 5 (6, 7, 8, 11, 12) sts at the beginning of the next 2 rows. Bind off remaining 17 (17, 17, 17, 15, 15) sts. Make a second sleeve by repeating Steps 30 to 44. Block all of the pieces to the measurements given on the schematic. Using mattress stitch, sew shoulder seams together. Place a marker or safety pin every 2 inches around the neck. Starting at the right shoulder, use the smallest needles to pick up and knit 9 sts between every 2 markers all the way around the neck. Place a marker and join to work in the round. Switch to the largest needles and purl 1 round to begin garter stitch. Switch to needles one size smaller and work 2 more rounds in garter stitch (knit 1 round, purl 1 round). Sew sleeve caps into place. Sew sleeve seams and side seams. Turn under hems at the turning ridges and then sew them in place. Keep these seams loose enough so that you aren’t causing any puckering. Weave in remaining ends and block again, if desired.